The House of Bourbon-Penthièvre was an illegitimate branch of the House of Bourbon, thus descending from the Capetian dynasty. It was founded by the duc de Penthièvre (1725–1793), the only child and heir of the comte de Toulouse, the youngest illegitimate son of Louis XIV of France and the marquise de Montespan, and his wife, Marie Victoire de Noailles, the daughter of Anne Jules de Noailles, duc de Noailles. The House of Bourbon-Penthièvre, sometimes called: House of Bourbon-Toulouse-Penthièvre, had been called the House of Bourbon-Toulouse during the lifetime of the duc de Penthièvre's father, the comte de Toulouse. The comte had received his title in 1681 as an appanage from his father, Louis XIV, and his residence in Paris, the Hôtel de Toulouse was named after this title. Upon his death, his descendents were members of the House of Bourbon-Penthièvre. Due to the illegitimate birth of the comte de Toulouse, members of the House of Bourbon-Penthièvre were not Princes and Princesses du Sang, although they held a high rank at court as members of the king's family, and lived in apartments near those of the king in Versailles. Because of the death, in 1768, of the prince de Lamballe, the son of the duc de Penthièvre, and the only heir to the title, the House of Bourbon-Penthièvre became extinct at the death of the duc in 1793, after having merged with the House of Orléans through the marriage of Mlle de Penthièvre, to the duc de Chartres. (The title of duc de Penthièvre was revived briefly in 1820 for Charles d'Orléans (1820–1828), the fourth son of Louis-Philippe I, King of the French.) At the death, in 1775, of Louis Charles, Count of Eu, son of the duc du Maine who had been a beneficiary of several great estates (the county of Eu, the duchy of Aumale and the principality of Dombes) of La Grande Mademoiselle (Louis XIV's cousin), the duc de Penthièvre was the sole heir of the duc du Maine's fortune, which, added to his own, made the Bourbon-Toulouse-Penthièvre family, consisting solely of the duc de Penthièvre and the duchesse de Chartres, the richest in France up to the Revolution of 1789. The House of Bourbon-Penthièvre is not only related to the modern day royal House of Orléans, but also, through the marriages of several of Louis-Philippe's children, to the royal houses of Belgium, Brazil, and Portugal. Louis Marie Félicité de Bourbon (born and died in 1754). Marie Adélaïde, duchesse d'Orléans and her father's eventual heiress. 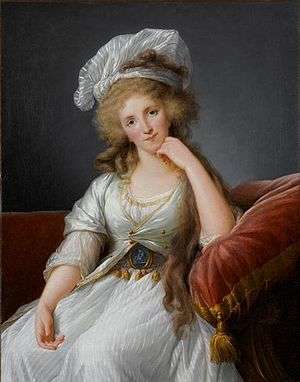 Painting by Élisabeth-Louise Vigée-Le Brun. prince de Carignan - this title was bought by the duc in 1751 from the House of Savoy. He later gave it to his daughter. Gouverneur de Bretagne, (Governor of Brittany). Part of the vast wealth accumulated by the duc de Penthièvre originally derived from the fortune of La Grande Mademoiselle, the first cousin of King Louis XIV. The duc du Maine's fortune was supplemented with many expensive gifts from his adoring father, the king. The duc had two sons, both of whom were childless, and when his last living son, Louis-Charles de Bourbon, comte d'Eu, died in 1775, the duc de Penthièvre was the sole heir to his fortune. The châteaux of Sceaux, Anet, Aumale, Dreux and Gisors were part of this huge inheritance. In addition, the duc de Penthièvre was the only heir of his father, the comte de Toulouse, from whom he inherited the Hôtel de Toulouse in Paris, and the Château de Rambouillet. The death of his son, the prince de Lamballe, in 1768, had left the duc de Penthièvre with no male heir and, as a result, his daughter, Mlle de Penthièvre, was his sole heiress. Louise Marie Adélaïde de Bourbon was first known as Mademoiselle d'Ivoy, then Mademoiselle de Penthièvre. In April 1769, she married her distant cousin, the duc de Chartres, who inherited the title of duc d'Orléans at the death of his father, Louis-Philippe I d'Orléans in 1785, but took the name Philippe Egalité during the French Revolution of 1789. Mlle de Penthièvre had brought with her a dowry of 6 million livres, and an annual allowance of over 500,000 livres. Upon the death of the duc de Penthièvre in 1793, the Bourbon-Penthièvre fortune Louise Adélaïde was to inherit was confiscated by the revolutionary government. It is only after her return to France during the First Bourbon Restoration of 1814 that she was able, through numerous legal battles, to regain what was left of some of her land estates, many of them having been either sold, gutted or nearly destroyed during the Revolution. The Château de Blois by Jacques Rigaud. had been the home of the duc de Saint-Simon, the notoriously acidic observer of the court of Louis XIV. 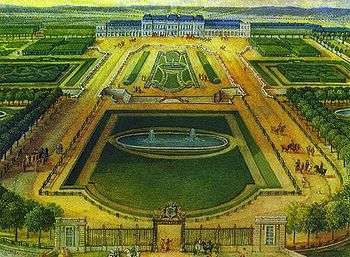 At the Palace of Versailles, the family also occupied a suite of apartments located on the ground floor of the Palace underneath the Grand Appartement du roi. Originally called the Appartements des Bains, they were the former apartments of Françoise-Athénaïs de Montespan, the mother of the duc du Maine, the comte de Toulouse, the duchesse d'Orléans and the princesse de Condé. On November 25, 1783, after having sold the Château de Rambouillet, to his cousin Louis XVI, who had given him the comté de Dreux, (County of Dreux) in 1775, the duc de Penthièvre transferred the nine bodies of his family from the 12th century Saint-Lubin church in Rambouillet to the Collégiale Saint-Étienne de Dreux. He himself was buried there in March 1793. On November 21, 1793, the crypt was desecrated by the revolutionaries and the bodies thrown into a grave in the Chanoines cemetery, the cemetery of the Collégiale. 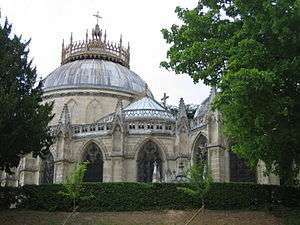 In 1816, the duc de Penthièvre's daughter, Louise Marie Adélaïde de Bourbon, duchesse d'Orléans, had a chapel built, on the site of the grave, as the new final resting place for the members of the House of Bourbon-Penthièvre. Today, the Chapelle royale de Dreux is the burial place of the members of the royal House of Orléans, into which the House of Bourbon-Penthièvre had merged when its heiress, Mlle de Penthièvre, married the duc de Chartres in 1769. 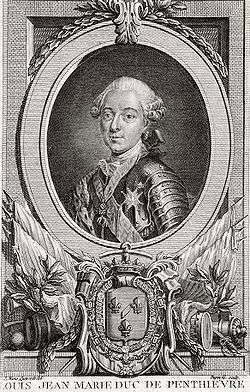 Louis-Philippe, King of the French, son of the duchesse d'Orléans. Of the members of the Toulouse-Penthièvre family who predeceased Louise Adélaïde de Bourbon, the only one not buried in the newly built chapel is the princesse de Lamballe. After her "execution", her body and head were buried separately, at different times, and probably not in the same mass grave in the Enfants-Trouvés cemetery in Paris. Later attempts to find her remains proved unsuccessful. The title of Penthièvre was in the possession of several noble families during the Ancien Régime. It has been used twice within the House of Bourbon, once as a comté and once as a duché. Previously it had passed by marriage from the Luxembourg (as a duché) to the Lorraine (as a comté) then to the Bourbon-Vendôme (again as a comté) families. Marie (1569–1623), married Philippe Emmanuel de Lorraine and was duchesse de Penthièvre in her own right. Françoise de Lorraine (1602–1669), married César de Vendôme (see below) and was daughter of the above. She held the title of comtesse de Penthièvre in her own right. Louis Joseph de Bourbon (1669–1712), son of the previous. The title of Penthièvre was not revived as a dukedom until it was given to Louis-Alexandre de Bourbon, comte de Toulouse in 1697. The comte de Toulouse chose to use it as the courtesy title of his son. 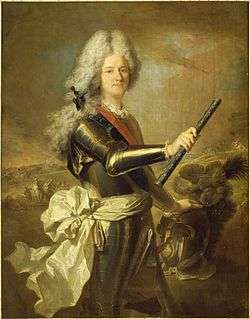 Louis Jean Marie (1737–1793), duc de Penthièvre, son of the previous. Charles d'Orléans (1820–1828), son of Louis-Philippe I, King of the French, and great-grandson of Louis Jean Marie de Bourbon, duc de Penthièvre. Pierre d'Orléans (1845–1848), son of François d'Orléans, prince de Joinville, and grandson of Louis-Philippe I, King of the French. Bourbon du Maine - extinct, related to the House of Bourbon-Penthièvre through the comte de Toulouse's older brother, the duc du Maine. ↑ G. Lenotre, Le Château de Rambouillet : six siècles d'histoire, Denoël, Paris, 1984, (215 pages), chapter 5: Le prince des pauvres. Vita Sackville-West, Daughter of France: The Life of Anne Marie Louise d'Orléans de Montpensier, duchesse de Montpensier, Doubleday, 1959. Lisa Hilton, Athénaïs:The Real Queen of France, Little, Brown & Company, 2002. Lady Antonia Fraser, Love and Louis XIV, Anchor Books, New York, 2006. 1 2 ib. G. Lenotre. ↑ The small medieval Saint Lubin church in Rambouillet, which was built on the village square near the castle, and which contained the crypt where the bodies of the Toulouse-Penthièvre family were buried, was demolished in 1872 after a new and larger church was built in a different location between 1868 and 1871. ↑ The Square Trousseau occupies the site of the former Enfants-trouvés cemetery in the 12th arrondissement of Paris.